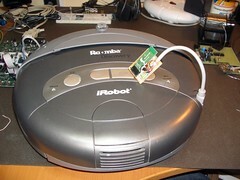 I created a couple of Roomba Bluetooth Interfaces. They work well and were easier to create than the Roomba Serial Interface. Unfortunately, “bluetooth as serial port” on computers seems a little raw. This is both for PC and Mac, though the Mac seems to be a bit more intelligent about it, perhaps because of its Unix core. It’s pretty cool being able to drive the Roomba around wirelessly. Or more exactly, the command line argument is given to the Java class you’re executing. Note the above are for unix-like systems, I don’t play with Windows too much, but you should be able to create a RUNIT.BAT file that works similarly to runit.sh. Do you use the -hwhandshake flag with the java.exe command line command? The hwhandshake flag is a command line argument. Windows. See, ‘RoomabCommSerial.waitForDSR’ for details.”. Where do you add the “-hwhandshake” into the code and where do you find the “RoomabCommSerial.waitForDSR” for more details? wassigan, I don’t sell them, but my good friends at RoombaDevTools.com has made a functionally identical device called the RooTooth. You can also buy a RooTooth from great hacker suppliers SparkFun. I have a RooTooth and it works great. Any chance you’d be willing to sell one of these for us time-challeneged folks who still like to play? The BlueSMiRF uses a BlueRadios Class 1 module. The Class 1 power rating means it transmits up to 100mW and thus is good up to around 100m (300ft). The SparkFun guys have verified this for their modules. Most Bluetooth devices are Class 2 (10mW, thus ~10m). A few are Class 3 (1 mW, ~1m). I’ve not tested it extensively, but I’ve managed at least 50ft out of it. I’m curious, what kind of range are you getting with the blueSmirf? I’m seriously considering building one, but I’d really like “whole-house” connectivity, and as I recall Bluetooth isn’t really designed for more that 10-30ft range.